A refrigerator leaking water on the floor can be an electric shock and slipping hazard. This issue needs to be fixed immediately to avoid causing injury. There are different areas a water leak will be coming from on your refrigerator. Knowing where the leak is coming from will help you to diagnose what could be wrong with your fridge. A rear water leak usually means the ice maker or water line is at fault. A leak coming from the front of the refrigerator usually means that a drain tube is clogged. A leak from the very bottom center of the refrigerator usually is caused by the drain pan having a crack or not being in the proper position. A water leak inside your refrigerator will usually occur if the drain line from the defroster is routed on the inside of your refrigerator. Since there are many different types of refrigerators, these troubleshooting tips and ideas will help you to get to the root of the problem and you may need to do a little bit of further research to fix the problem. Consulting your refrigerator owners manual will assist in fixing your specific model. This usually means that your refrigerator is a self defrosting model and the drain line has become clogged. The easiest way to fix this is to unplug the fridge, remove the front plastic guard on the front of the fridge. Once removed there should be a plastic tray that slides out. Search for the end of the drain line. Once found put the end of the drain in an empty bucket. Next remove the top portion of the drain tube. Inspect for any chunks of ice that can be clogging the line. If ice is found, run the area of the line with ice under hot water to melt it. Once the clog is removed, reinstall the drain line and check periodically for leaks. This usually means that there is a hole or crack in the bottom drain pan. The drain pan could also be positioned wrong so the water is going directly on the floor. 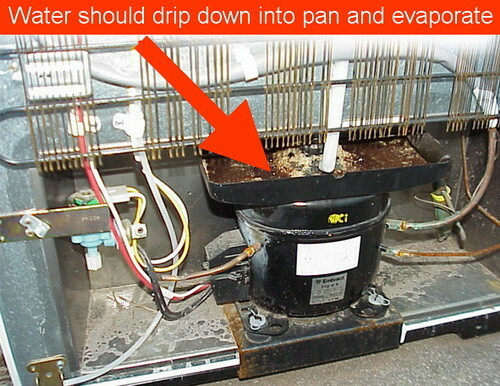 NOTE: Some refrigerators have the drain pan (condensate pan) mounted directly on the compressor. The drain pan catches any water that may be leaking downward from the fridge. When water is on the floor, fix this by doing a visual inspection on the drain pan making sure there are no cracks or holes. Be sure to make sure it is positioned correctly if it is not mounted to the compressor. Excessive humidity can create more water going into the drain pan. When water enters the drain pan, it will evaporate from the heat the refrigerator is producing below and you will never even notice there is water there. So, if you find water under the drain pan, just make sure it not damaged. Check periodically to be sure the leak has stopped. A rear water leak on your fridge will almost always mean the water valve or water line is leaking. 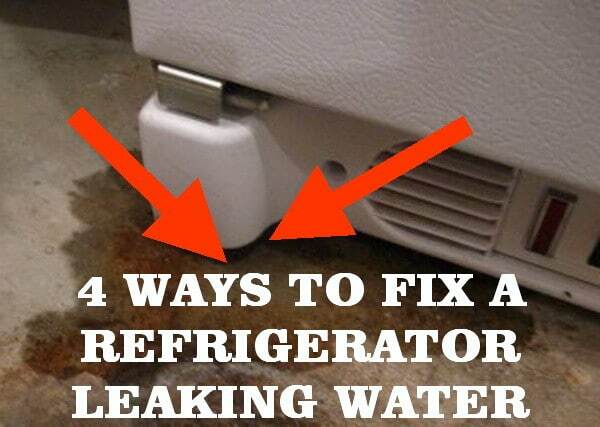 To fix this, unplug the refrigerator and check the water line coming from the wall to the fridge. Also check the water line that goes from the bottom of the fridge and then enters the back of the freezer. The solenoid that opens and closes the water valve can also be leaking. Another leak can occur on the valve in the wall that turns the water on and off for the ice maker and water dispenser. If you have a water filter installed on the water line, check to be sure the connections are tight. Check anywhere that water flows and be sure there are no holes in the water line. Also check to be sure a water line has not pulled out and is leaking directly onto the floor. If holes are found, replace the water line. This will usually mean that the drain line from the defroster is routed inside the fridge and it is clogged. Most drain line outlets are located behind the refrigerator crisper drawers. Remove the 2 drawers and look for the drain line outlet. Once found get a mirror and try to look inside the top of the drain outlet. Inspect for anything that may be clogging it. If nothing is found, remove the drain line from the other end so you can pour hot water into the outlet and it will come out of the drain line on the other side. This should remove any junk that may be clogging the line. You can also use a mini plumbers snake to make this easier. If you do not have this then a hard long piece of wire can be used. Once the clog is removed put everything back together and periodically check for leaks. This can be caused by bad door gaskets. If outside air is entering your refrigerator through worn or ripped door gaskets, it will cause excessive moisture in your fridge causing water to drip down and overfill the drain pan. When the drain pan overflows, it has nowhere else to go but onto your floor. A dirty door gasket or food stuck on the door gaskets can also cause this. 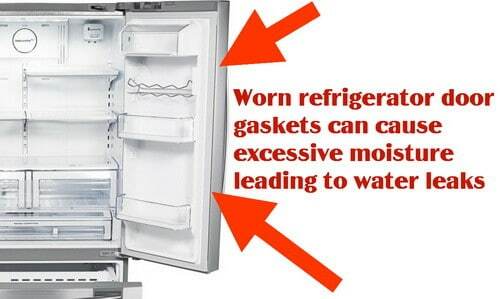 If your fridge door does not shut properly, from bad gaskets or similar, excessive moisture will occur. To fix this problem you can simply replace the door gaskets. You can also make sure the bolts that hold the door on your refrigerator are tight and holding the door secure. Refrigerator door gaskets can be found online for a reasonable price. If you know of other reasons water will leak from a refrigerator and ways to fix them, please leave a comment below. I have a 5 door, 26.8 ft French door Whirlpool refrigerator. We just noticed water coming up through the vinyl flooring planks. Rolled it out and noticed water pooling on the bottom right rear, near the water inlet hoses, with moisture on the copper tubing. Having a repairman come out tomorrow. Two weeks left on warranty. Shutting the water off seems to stop the leaking. On an expensive refrigerator, I want the water on. What I find odd is that the water is pooling on the flat metal, and there is a large square hole next to it. I can see my floor through the hole. The water has apparently been dripping, pooling, and going out through that hole. Why is there a large square hole in that spot. Of course the water will drain onto the floor. I have a Whirlpool side by side fridge I just hooked up the water to it and when I turned the water on it spewed out all over the place. I found that the water valve that has 2 sets of wires and 3 hoses going to it was cracked I replaced it with an oem one and replaced the filter being worried about any other leaks I really watched everything underneath and I noticed that every few minutes a drip or so comes out of the oval opening on the bottom of the filter housing and drips into the catch pan is that normal or is there an issue with the filter housing now? Check that no valves or housings are cracked or missing an o-ring. Retighten all water lines and be sure you have plumbing tape on the water line threads to prevent water leaks. I believe it is Hotpoint that makes or made a fridge that defrosts into a tray between the freezer (freezer being on the top) and the refrigerator portion. It does not have an exterior drain tube or pan. The water will then find its way down, during defrost cycle, to the fridge where the warmer air prevents it from freezing and causes it to pool at the bottom or in the crisper drawers. Sometimes chipping out the ice by hand works, but I believe it is caused by a worn Styrofoam vent gasket in the back of the freezer. As of yet, I have not figured out a way to fix this.